Skin Camouflage helps build your confidence and self-esteem helping you to get on with everyday life. 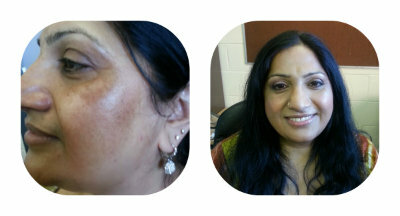 Skin Camouflage is a medically based, water-proof product used to conceal a wide range of skin conditions. Camouflage products are completely safe to use, look and feel natural on the skin and available for men, women and children. It is easy to apply, can be worn every day and because it is waterproof you can shower, swim or play sports and it will not run or smudge.It will last up to 12hrs on the face and up to 36hrs on the body. The final decision lies with you. When the colour and product has been chosen, I will apply to half of the affected area, then I will guide you as you apply to the other half.I will teach you all the techniques and tips to achieve a quick, long lasting, natural outcome. I offer an individual one hour skin camouflage consultation where I will colour match products for your skin tone and then apply to a small area of your skin trying different products to find the one you are most happy with, the final decision lies with you. When the product and colour has been chosen, I will then apply it to half of the affected area, showing you the easiest techniques and tips to achieve a quick, long lasting result. You can then apply to the other half where I will guide you and answer any questions throughout this process. My aim is to give you confidence in application. I’m very happy to discuss your specific needs with you on the phone or you can email me with any questions. HOW DOES SKIN CAMOUFLAGE WORKS? Skin Camouflage is the skilled application of specially formulated creams designed to minimise the discoloration of the skin by covering, concealing and disguise them at surface level. The treatment means that your appearance is improved as the focus is no longer on the area or discoloration that you wish to hide; improving your confidence and self esteem. It is simple to apply, and does not interfere with any medical treatment in progress on the effected area, so can even be used for post operative scarring, cosmetic surgery, and bruising. Most of the products used, although lightweight when applied correctly, are also water resistant meaning you could continue with sporting activities such as swimming whilst wearing the camouflage. Creams can last up to 8 – 12 hrs on the face and body. WHAT HAPPENS DURING A SKIN CAMOUFLAGE TREATMENT? 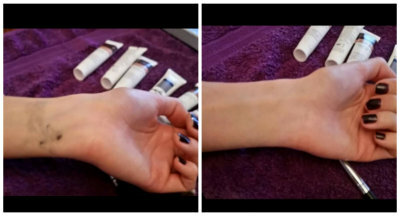 A skin camouflage consultation takes approximately one hour, during which time the specially formulated skin camouflage creams are tested directly onto your skin to find the nearest match to the colour of your skin. They are not chosen from a colour match card,they are custom made for you. Finishing powder is then used to make the cream waterproof. Advice will be given as to how to prepare the skin, how to mix and apply the creams and you will be made to feel comfortable with using them. You should feel able to ask the practitioner lots of questions and try out various creams until you find a suitable product for you. Once the product and colour has been decided, it can be obtained via a prescription ( at your doctors discretion) or purchased online, or from myself. I will give you a list of the products used.